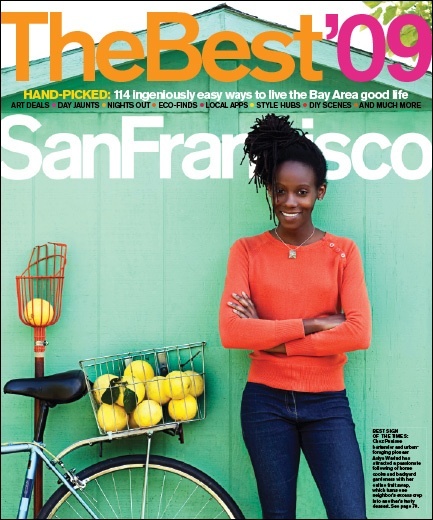 The votes are in and the Bay Area’s favorite food forager is Asiya Wadud, the Chez Panisse bartender and urban fruit gatherer. For the last 18 months or so Wadud could be found pedaling around South Berkeley and North Oakland scooping up fallen or really ripe fruit, such as hachiya persimmons, Santa Rosa plums, Meyer lemons, and Persian mulberries, and passing on this excess backyard bounty to hungry souls who put it to delicious good use. I first learned about Wadud’s fruit-bartering-via-bicycle project in the San Francisco Chronicle earlier this year. Since then she’s been featured in the New York Times and her photogenic self graces the cover of this month’s San Francisco magazine. Last week a New York Times Magazine story on urban homesteading included Wadud at the table of a local-grown feast. Clearly, her fresh idea has captured the mainstream media’s — and the produce-loving public’s – attention. Wadud’s rules for her volunteer program are simple: There’s no picking before permission is given. Ripe fruit is a terrible thing to let rot. Sharing the wealth with your neighbors creates good feelings and good food. She began with cold calls, knocking gingerly on strangers’ doors and asking politely for samples; she now boasts some 200 members. Similar free, urban foraging programs abound in the Bay Area. Saddled with excess beans or blackberries this summer? Looking to trade some lavender for lemons? Check out People United for a Better Life in Oakland (PUEBLO), North Berkeley Harvest, San Jose’s Village Harvest and Marin Open Garden Project. In L.A., Fallen Fruit is a resource for off-loading extra produce. Programs that connect homeowners overwhelmed with fruit with volunteers willing to pick produce and take it to local food banks can be found in cities such as Portland, Ore., Philadelphia, and Boston. And websites like neighborhoodfruit.com and veggietrader.com help folks find willing homes for, say, a surplus of Meyer lemons or an abundance of dinosaur kale. Future foraging posts will look at programs that offer folks freshly foraged local food for a fee. In the meantime, since it’s peak produce time in most parts of the country, you’re encouraged to leave a shout out for your favorite, local, free foraging outfit below. Oh, and while I think of it: Does anyone want the load of loquats that make a huge mess once they fall from the tree out front and strip the paint off my car? I’ve thought of them as a nuisance, squirrel fodder at best, but Wadud writes that this unfamiliar fruit makes some mighty fine chutney, jelly, or jam. Happy harvesting. Thanks for the mention! Village Harvest is booming; our volunteers harvest extra fruit from local backyards and small orchards, then pass along to community food agencies. Since our founding in 2001 we’ve grown to become one of the oldest and largest groups of this type in the country. In 2008 over 430 volunteers harvested 122,000 lbs of nutritious fruit, and we will harvest much more in 2009. Although Village Harvest started in the South Bay, our volunteer teams now operate year-round in many parts of the greater SF Bay Area. People with trees or interested in volunteering can visit our web site http://www.villageharvest.org for info and to sign up. The site also has helpful general information on fruit tree care, harvesting, and using fruit. This is such a darling project that Asiya has created in Oakland. The magazine cover and Asiya are fun, happy and absolutley stunning. I tried to find something like what I’m doing in my town, we are East of Oakland in Walnut Creek, Concord, Pleasant Hill, Martinez, Clayton. I couldn’t find anything. For the first few months, I never even had a blog. The first few journalists who covered my story suggested that I create a blog…that’s how I became ‘The Lemon Lady’. Just on my own, I average 2,000 pounds of fruit harvested per month. I also help establish community gardens and donate seedlings to needy organizations. Anything to do with food gathering, growing or collecting – is so much fun!